Whole wheat buttermilk pancakes made with pumpkin puree, pure maple syrup, pumpkin pie spice and pecans – a perfect lazy autumn Sunday morning breakfast. Other fabulous fall inspired pancake recipes are Pumpkin Spice Pancakes with Pumpkin Butter, 4-ingredient Flourless Banana Nut Pancakes, Eggnog Pancakes and Heart Shaped Chocolate Chip Banana Pancakes. I’m not a big breakfast person, usually a green smoothie, a simple hard boiled egg or some overnight oats in a jar is all I need to keep me fueled until lunch. But on Sundays, we wake up a little later and have more time to make a more extravagant breakfast. My kids love pancakes so I often treat them to Sunday pancakes. Now that pumpkin season is here, I’ve been making these nutty pumpkin muffins – they are so good no one knows I use whole wheat flour in place of white flour. Happy Sunday! Mix all dry ingredients (first 5 ingredients) in a bowl. Combine wet ingredients with the dry and mix well with a spoon until there are no more dry spots then fold in pecans. Don’t over-mix. Heat a large skillet on medium-low heat. Spray oil to lightly coat and pour 1/4 cup of pancake batter. When the pancake starts to bubble and the edges begin to set, about 2 minutes then flip the pancakes and cook an additional 1 1/2 to 2 minutes. Repeat with the remainder of the batter. Could you use GF flour for this? If yes same amount? Yes, a good all purpose GF mix would work, same amount. Just had a craving for pumpkin pancakes for dinner. Made these and they were great. Next time I will use a few tablespoons of splenda in the mix. I like a sweeter pancake, as I do not use syrup. I used one egg instead of three whites. Just made these this morning, and I like a little sweeter pancake too. Next time I’ll try a bit of Splenda, but I also think it needs more pumpkin pie spice flavor. Absolutely wonderful! Doubled the recipe and used half whole wheat flour and half spelt flour. Thanks! I was going to make GF pumpkin muffins today but I think I'll wait until tomorrow and make GF pumpkin pancakes instead! Your's look delicious! Hope mine can look similar! Thanks so much for the recipe! I was so desperate to eat these pancakes that I substituted the buttermilk for almond milk( I know that's not a good substitution), tha pea cans for walnuts, and used regular wheat flour. I know i definatly changed the taste of the original recipe , but it was still so delicious! Gina do you know how to convert this recipe for waffles? Thanks! Perfect pancakes! These were the best I've ever tasted! Thank you so much for sharing this recipe. Can you please provide instructions on how to convert the batter for waffles? Thanks! These look so good…can't wait to try them. These look delicious! My son is allergic to eggs and I'm always unsure if I can replace egg whites with my usual fruit substitutes (banana, applesauce, pumpkin). Do you know if they would turn out good if I increased the pumpkin to 1 cup and left out the egg whites? Can we use almond milk by itself or do we add some acidity to that as well? These are so good. I usually make enough for my whole work week. I eat them with some banana slices and turkey sausage. I don't add the maple syrup. I just add 2 tbsp. brown sugar instead. Yummy!! I think it goes in the pancake batter. I use brown sugar instead. I put them in the batter, then serve it with extra on the side for topping. These look yummy and I have more pumpkin purée to use from last night when I made your Pumpkin Banana bread (which is almost gone between my husband and I!) not surprised. I want to omit the pecans from this recipe. How many points from the new point system do I take away? Plus I think the point system is different here in Canada. The Pumpkin Banana Bread was 4 points instead of 3. It says in the recipe that the syrup mixes into the wet ingredients. Hope that helps! Like others, I too am wondering where that extra tbsp of maple syrup goes. I have these on my dinner menu for this week and just wanted to check before I make them. Thanks! My 10 and 13 year old nephews loved these! Thanks! We just had these for dinner! They were great! They will be making a regular appearance in our house. Thanks for all your great recipes. These were fabulous! We had them for dinner the other night YUM! Yumm. My grocery store didn't have pumpkin pie spice! I'm on a mission to find some. It's October, it shouldn't everyone have pumpkin pie spice?! Looks delish! 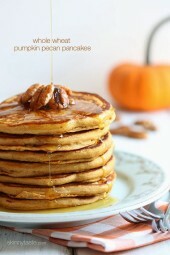 Making pumpkin pancakes is on my fall to do list so this is most definitely happening. Thanks for the recipe! We are dairy free due to my 6 month old's intolerance. Is almond milk ok? Was wondering if you knew how to convert your pancake recipes to waffle recipes. Just bought a new waffle iron and would love to make these as waffles. 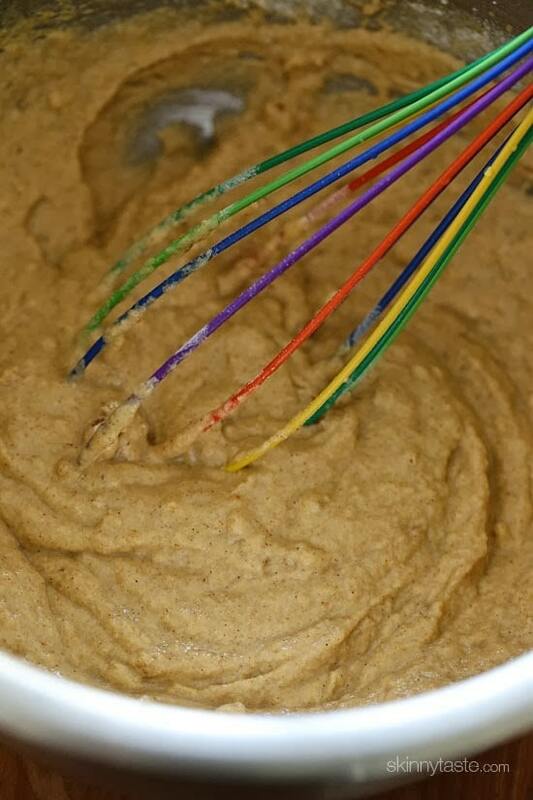 My son has an egg allergy and some of the things you can replace it with is 1/3 cup applesauce or 1/3 pumpkin puree or 1/4 cup veg oil or 1/2 cup pureed banana for one egg. 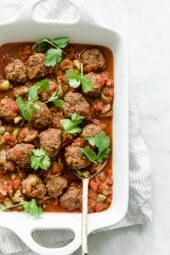 What would you recommend for this recipe? Thanks, I am a huge fan of your recipes!!! Chia Seeds work great as an egg substitute. This site has excellent instructions on how to do so. 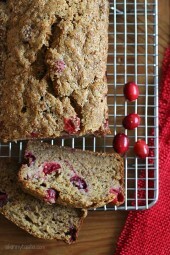 Can you use whole wheat flour that isn't white? Yes but it will change the taste. I, too, am a bit confused as to how much maple syrup goes where, and when. I put the 2 Tbsp in the batter; it worked out fine. Can we use almond milk or skim milk if we don't have buttermilk on hand? It's the only ingredient I'm missing! Gorgeous! I could definitely use this for breakfast right now! These look amazing! And I love that they are a bit lighter than traditional pancakes. I LOVE pancakes, and adding pumpkin to the mix makes them so much better!! Oh these are SO going to be on the menu for breakfast this weekend! Thanks Gina!!!! Love your recipes!!!! 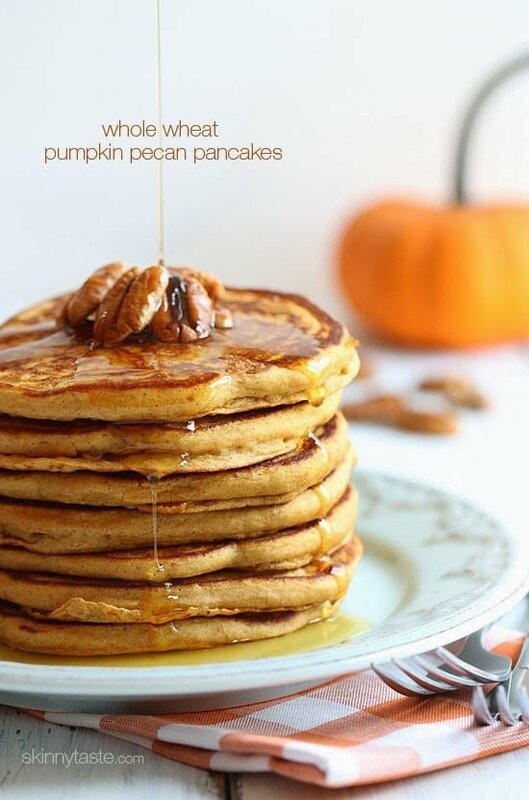 I am loving anything pumpkin this season, and those pancakes sound like the perfect Sunday breakfast! I just wanted to tell you that we had your skinny swedish meatballs and your potato parsnip mash (sans the rosemary) for supper tonight. My husband and my picky 11-yr old son both approved! Actually my son ate more than I have seen him eat in a long time! I will be making both of these recipes again real soon. Thanks for the great recipes! I've got breakfast for dinner on the menu this week and i will DEFINITELY be making these! Breakfast for dinner…can't wait! 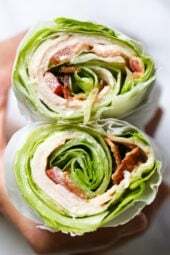 I will triple the recipe and freeze leftovers for easy breakfasts and for school lunches. Thanks so much for providing ideas for every single meal I make! I'm in the process of making these right now! I'm a little confused, however, by the recipe calling for 2 Tbsp maple syrup but then only one in the actual recipe?? I, too have the issue of no buttermilk, but I do have Almond Milk and Skim Milk.. are either workable? I'd like to make these right now! I do NOT have buttermilk, only have fat-free milk. Can I use the fat free milk? Put 1 TBSP of vinegar or lemon juice in a measuring cup, then add your milk to the 1 cup line and let set for 5 minutes. That's a good substitute for using regular buttermilk. Since I rarely use it, I just never buy buttermilk. I always use the vinegar or lemon juice trick and it works perfectly! You could try buying the powdered buttermilk and just keeping it in the freezer that's what I do. I'm not sure if buttermilk freezes but you can always try that in ice cube trays. I love the powdered buttermilk! Buttermilk freezes really well! You just need to thaw and whisk it a bit before using. Oh my goodness these are the best pancakes I have ever made! Saw this recipe first thing this morning, and had leftover pumpkin from making your pumpkin sherbet last night with my granddaughter also delish! My granddaughter really loved both, and good for her too! Thank you for providing us with the best recipes!